Writing for the Wall Street Journal, Mike Hulme has given us the most eloquently clear and reasonable outlook on the intersection of science, politics, economics, and the public that I have yet come across. I am a climate scientist who worked in the Climatic Research Unit (CRU) at the University of East Anglia in the 1990s. I have been reflecting on the bigger lessons to be learned from the stolen emails, some of which were mine. One thing the episode has made clear is that it has become difficult to disentangle political arguments about climate policies from scientific arguments about the evidence for man-made climate change and the confidence placed in predictions of future change. The quality of both political debate and scientific practice suffers as a consequence. Surveys of public opinion on both sides of the Atlantic about man-made climate change continue to tell us something politicians know only too well: The citizens they rule over have minds of their own. In the U.K., a recent survey suggested that only 41% believed humans are causing climate change, 32% remained unsure and 15% were convinced we aren’t. Similar surveys in the U.S. have shown a recent reduction in the number of people believing in man-made climate change. One reaction to this “unreasonableness” is to get scientists to speak louder, more often, or more dramatically about climate change. Another reaction from government bodies and interest groups is to use ever-more-emotional campaigning. Thus both the U.K. government’s recent “bedtime stories” adverts, and Plane Stupid’s Internet campaign showing polar bears falling past twin towers, have attracted widespread criticism for being too provocative and scary. These instinctive reactions fail to place the various aspects of our knowledge about climate change—scientific insights, political values, cultural moods, personal beliefs—in right relationship with each other. 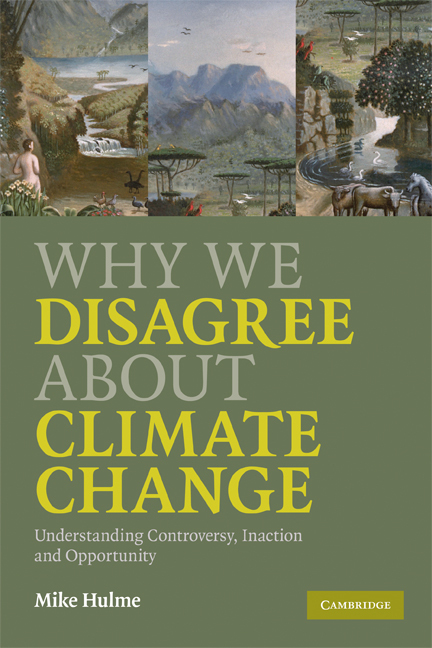 Too often, when we think we are arguing over scientific evidence for climate change, we are in fact disagreeing about our different political preferences, ethical principles and value systems. If we build the foundations of our climate-change policies so confidently and so single-mindedly on scientific claims about what the future holds and what therefore “has to be done,” then science will inevitably become the field on which political battles are waged. The mantra becomes: Get the science right, reduce the scientific uncertainties, compel everyone to believe it. . . and we will have won. Not only is this an unrealistic view about how policy gets made, it also places much too great a burden on science, certainly on climate science with all of its struggles with complexity, contingency and uncertainty. The events of the last few of weeks, involving stolen professional correspondence between a small number of leading climate scientists—so-called climategate—demonstrate my point. Both the theft itself and the alleged contents of some of the stolen emails reveal the strong polarization and intense antagonism now found in some areas of climate science. Climate scientists, knowingly or not, become proxies for political battles. The consequence is that science, as a form of open and critical enquiry, deteriorates while the more appropriate forums for ideological battles are ignored.